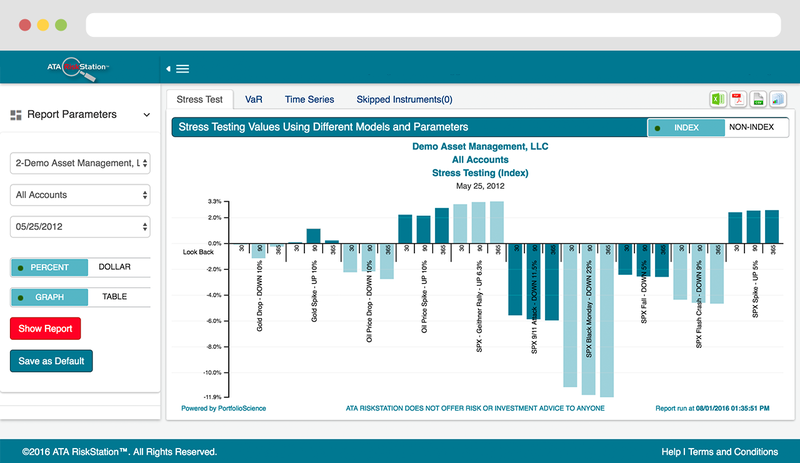 ATA RiskStation was built for financial professionals like you. Help clients stay on plan, expand wallet share with existing clients and successfully compete for new client relationships. Broker Dealers and Banks: With new regulations on the way, do you have a fully automated mechanism in place to confirm that current client portfolio risks are aligned with current client risk tolerances? We can help. Not all managers are in a race with stock market returns. Many strategies, by design, assume much less risk than equities and can be overlooked by return-based filters that miss superior risk/reward characteristics. Better articulate the risks embedded in your strategies and more effectively communicate with advisers, consultants and institutional investors about the stability of your strategy’s risk profile over time. Today’s historically low rate environment makes achieving long-term return targets a real challenge without assuming incremental risk. Empower a small internal team to monitor and report on daily risk across all manager allocations individually and for the portfolio as a whole. 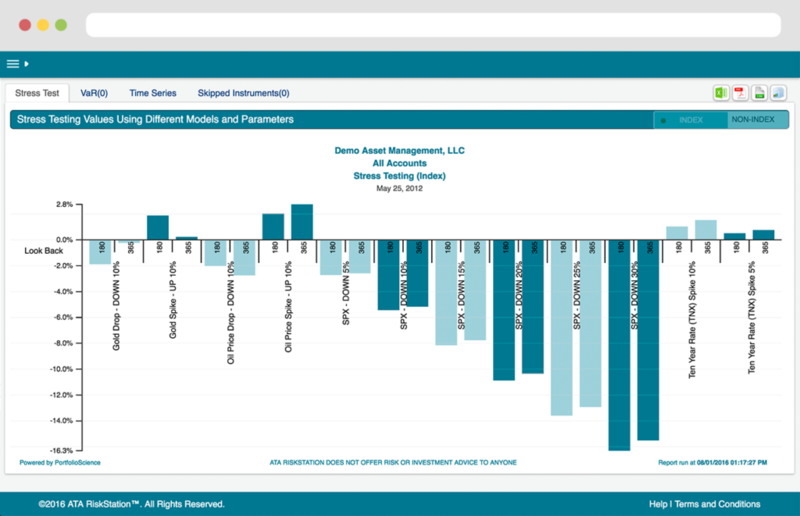 The core premise of ATA RiskStation™ is that no single measure of risk is perfect and reliably models downside exposure in all market conditions and for all portfolio types. Recognizing that individual risk models can include debatable assumptions about how market data is distributed, the stability of those distributions, the volatility of individual positions and the correlations between the portfolio holdings, it becomes clear that the final risk projections are highly dependent on many assumptions that may, or may not, hold true in the future. Furthermore, additional assumptions about the “correct” period of time to use for a risk analysis or the confidence level selected, further increase the range of projected risk outcomes from even a single risk model. Responsible for your firm's compliance efforts? We can help. As advisors move toward a fiduciary role, suitability issues will become more complex. Previously, if an advisor placed an investment in a client account, it just needed to be “suitable” at the time it was made. Now, as advisors assume a fiduciary duty to clients, they will need to pursue closer alignment between currently embedded portfolio risks with the client’s current goals and risk tolerances. 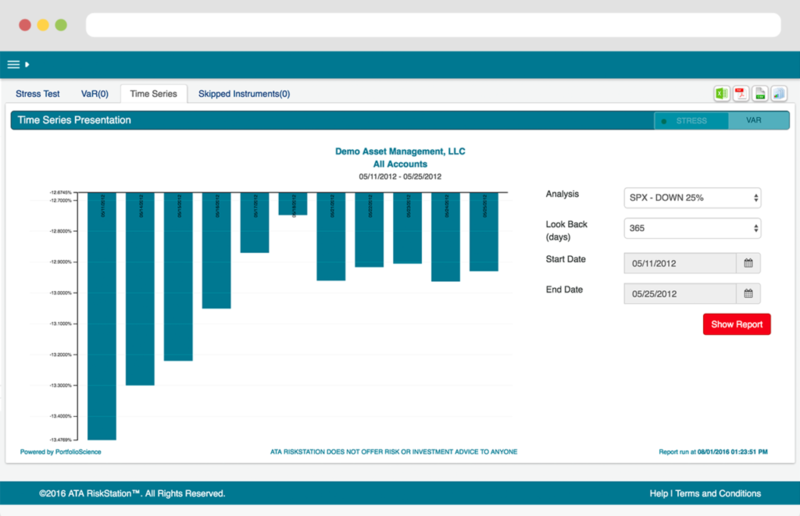 ATA RiskStation™ technology can, on a daily basis, systematically monitor and report on portfolio risks for any defined scenario against the risk tolerances expressed by the client to an advisor at the most recent meeting. If risk mismatches for any client are identified during nightly processing, e-mail risk alerts are automatically sent to the advisor and all other authorized oversight groups or individuals at the firm. Find out how ATA RiskStation can help your clients. What is a “Risk Utility℠” Anyway? A utility is always ready when the user needs it. You expect a wall outlet to always deliver electric current and a land line to always have dial tone. The concept behind ATA RiskStation™ is that questions about portfolio risk can arise at any time so timely and current answers need to always be available on demand. Why Do We Process Daily? We have several service levels, please contact us or click get started for more details.